In the writing world, we often hear the advice to show, don’t tell. Worded like that—with a “don’t” admonition—we can easily assume it’s a writing “rule,” or that showing is better than telling. However, as I’ve mentioned many times before, telling isn’t bad or something to be avoided at all costs. In fact, our stories need telling. I was reminded of the problems with the usual assumptions by an older-but-fantastic post by Cecilia Tan that I recently came across. Her insights added a whole new layer to why advice to show, don’t tell doesn’t work and, in fact, can be downright harmful. New writers often find it easier to tell than to show. Showing what emotions look and feel like takes a lot more effort. Flat descriptions of setting are easier than deep point-of-view (POV) insights from our characters. Actions are easier to describe in straightforward narrative than it is to include all the senses. Etc., etc. Much of children’s literature is written with more tell than show, and the deep POV style of modern fiction—which tends to go hand-in-hand with showing—is a fairly recent trend in the literary world. That means for many of us, we have more experience with stories that tell than with those that show. However, once we learn how to show, that assumption of too-much-tell-not-enough-show doesn’t ring nearly as true. Instead, after we learn that skill, we might even go overboard and fail to tell as much as our story needs. Or in deep POV, virtually all our character’s thoughts are technically telling. Thoughts can’t be shown quite the same way other writing elements can be. And I’d bet most of us have read stories where we reached one conclusion (from being shown something), and we’re told to accept a different conclusion by the character’s thoughts (from being told something). But I want to dig deeper into that last bullet point. I’ve talked before about how important context is when it comes to telling vs. showing. Context is critical for ensuring readers aren’t confused, and providing context often requires us to tell. While story questions are good, confusion is bad. Often goals, motivations, stakes, or other important story aspects need to be brought out of the subtext of showing and at least hinted at to readers more directly, or else they won’t understand the fundamental elements of the story. But there’s another aspect of context to consider: worldbuilding. While we might thinking of worldbuilding in reference to fantasy or science fiction stories, in truth, almost all stories have elements of worldbuilding. Our story world includes not just the settings and props, but also our character’s situation. Are they a single parent struggling to keep their job and stable childcare? Are they a reckless teenager trying to find their way after experiencing rejection by their parent? Are they a new shapeshifter scared by their transformation and experiencing very different sensations for the first time? Obviously, those story worlds would be very different. And yes, most of a character’s situation can be shown, but the meaning behind situations often need a telling explanation or deep POV thought here and there. The hints to bring goals, motivations, stakes, fears, story problems, emotions—or explanations of situations/worldbuilding—out of the subtext are bits of telling for context. worldbuilding with genres—fantasy, science fiction, historical romance, etc. worldbuilding with settings—Harry Potter’s Hogwarts, cozy mysteries’ small towns, motorcycle-club romances, etc. worldbuilding with cultures—#ownvoices stories, Deep South vs. New York stories, non-U.S.-based stories, etc. Not only is telling necessary for worldbuilding of all types, but worldbuilding also increases story immersion, which is the opposite effect we usually expect from telling. Worldbuilding helps carry us away from our reading experience. We’re no longer sitting in a doctor’s office, staring at our ereader. We’re on a journey with the characters, fully immersed in the story. Most stories include worldbuilding. Worldbuilding details are often telling. Worldbuilding is good for story immersion. Therefore telling is not inherently bad for our stories or automatically a sign of bad writing. Cecilia points out that the “rule” of show, don’t tell comes from the MFA programs of literary fiction, where stories are supposed to be so “universal” that they have no genre—and no need of worldbuilding. Should we ignore the advice to “show, don't tell”? Click To TweetIn addition to what that perspective implies about the inherent “inferiority” of genre fiction simply due to its need for worldbuilding-style telling, that assumption of universality also comes from a place of privilege. As we’re all exposed to the typical situations of straight white males through all types of pop culture, we often don’t need extra information to give context to their story situations. But as listed in the worldbuilding types above, the cultural aspect of non-white-male stories usually requires worldbuilding. Look at the literary fiction techniques that are supposedly the hallmarks of good writing: nearly all of them rely not on what was said, but on what is left unsaid. Always come at things sideways; don’t be too direct, too pat, or too slick. … Make allusions and references to the works of the literary canon, the Bible, and familiar events of history to add a layer of evocation… These are the do’s and don’ts of MFA programs everywhere. They rely on a shared pool of knowledge and cultural assumptions so that the words left unsaid are powerfully communicated. Stories from historically marginalized populations don’t fit the “universal” MFA-ideal simply because the generic reader doesn’t have the necessary background information to understand the meaning or importance of situations. Not everything can (or should) be expressed in subtext or allusions for most genre stories, much less those with elements from a diverse population. Does your story need worldbuilding? It's okay to tell rather than show. Click To TweetThese stories need to include context for readers, yet the typical advice implies that telling of any kind, including for worldbuilding, is “bad” writing. That’s just another way of bashing non-literary-fiction stories due to arbitrary measurements of what constitutes quality. In other words, the advice of show, don’t tell is inappropriate for stories that need worldbuilding. And as that description applies to not just stories with cultural aspects beyond the U.S. or straight-white-male experience, but all genre fiction, any advice that automatically assumes telling is bad writing or “less than” showing is borderline offensive for being blind to its inherent privilege. How often have you heard the advice to show, don’t tell? Did you think that good advice? Do you agree that the advice implies that showing is better than telling? 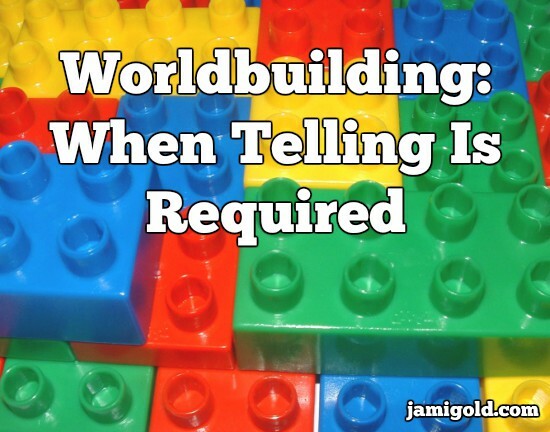 Did you ever think about how the advice doesn’t apply to stories with worldbuilding? Did you come away with other insights from Cecilia’s post? Yes, given my blog posts, it’s obvious I have issues writing short too. LOL! Anymore, for me, the advice to ‘show don’t tell’ is down there with ‘write what you know’ as being questionable advice. If we only wrote what we know in the strict sense that some take it, we’d have no genre fiction at all. I much more like the advice to ‘write what you feel’ in other words tap into the universal experience of emotion and the things that give us the most emotional points in our lives. That works for all genres. I had never thought about ‘show don’t tell’ coming from a place of privilege but it makes so much sense. Assuming everyone’s life experience is like our own is not a good look for a writer. That’s a great point about the “write what you know” advice. You’re right about how the emotional aspects of stories are far more universal than settings or situations anyway. For me, as a genre girl who needs to do research to include all that necessary worldbuilding, I often think of it as “write what you want to learn about or dig into.” 😀 Thanks for sharing that insight! Thanks, we do need both. I find in children’s books, all telling comes across as lectures from adults and makes for remarkably boring reading. Sometimes you need to show what can go wrong. I have found that showing doesn’t allow for concise writing, making scenes, chapters, and the book in general awfully long when I’d rather just know what the story is about. LOL! Yes, showing uses a lot more words for sure. I just came across this great post with examples of the different degrees of showing vs. telling and when we might want to use each. 🙂 Thanks for stopping by! I bookmarked the page you gave. In many cases, I can see how the exposition way would be what I want. I just feel that “showing” is being overrated these days. Oh, very true about international readers or the autism spectrum. I recently finished reading The Kiss Quotient by Helen Hoang. It’s an excellent autism-spectrum #ownvoices romance — a gender-flipped Pretty Woman premise — and the heroine struggles so much with understanding what’s expected of her, as the subtle approach doesn’t work with her. Ooh, I just added that book to my wish-list. 😀 Awesome that the hero is part Vietnamese. Reminds me of one of my main crushes, who is a very handsome Vietnamese trans boy. 🙂 That’s awesome that there’s both showing and telling!